Nearly all the reviews I’ve read peg Brave as an “okay” film, but nowhere near great. After reading so many such articles, I went into Brave with rather lowered expectations. Maybe that helped, because I didn’t think it as much a disappointment as some critics made it out to be. The story was fine. It won’t prompt intense philosophical discussions and thoughts about life and death and the purpose of life like the Toy Story films did, nor does it put a wholly new spin on stories about family as Finding Nemo or Incredibles; but it is a fairly solid story, despite being a tad generic (parent/child disagreements which end with both sides coming to an understanding). But if we’re going to talk about generic, then I consider Ratatouille and Cars to have generic storylines too. So this really isn’t something that’s shockingly new in Pixar’s record, I think. It does swing quite a bit in tone; from the humour and raucous roughhhousing of the men of the clans, to the quiet tension and later tenderness between mother and daughter. Frankly, as it was quite easy to predict how the mother-daughter issues would be resolved, I was more interested in the clans because they were more amusing and it seemed trickier to resolve the problem of clan lords disgruntled because the princess won’t or can’t make her choice of which young man to marry (and, I suppose, the perceived insult in her not choosing any of them). I do agree with some critics in that it might have been more interesting if they had taken a slightly different direction – for instance if they had made the repercussions of Merida’s actions more immediate and intense, it might have given it that “more mature” edge that people have come to expect from Pixar. Then again, that might have detracted from the central story, which was the relationship between Merida and her mother. I found myself gaping not at the crazy mess that is Merida’s red hair, but rather at the texture of her clothing Amazing to look at. When she ran through the river her dress got wet and it looked like a realistic representation of what would happen to the material when soaked with water. Trying to imagine how long it took to get that look right and how long it would have taken to render a single frame of that boggles my mind. I salute their simulation department. The music was very Scottish. I’d forgotten how accustomed to bagpipes I’d become. (That doesn’t mean I want bagpipe music being blasted right into my ear. It just means I don’t find bagpipe music as alarming or annoying as I did prior to my year in Edinburgh.) I have no complaints about the music, which was written by Patrick Doyle. It didn’t cement an impression in my mind like music by John Williams or Danny Elfman or Hans Zimmer tends to do, but it was quite effective in putting the feeling of Scotland across. – The witch looks very much like the old female characters in Miyazaki’s Studio Ghibli films… Just a little more spry. 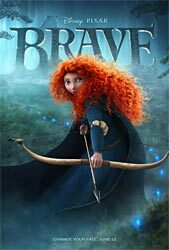 Although I can’t say that Brave is one of Pixar’s great works, I wouldn’t say it’s their worst either. It’s an entertaining watch, with a scene that I found really touching (and if a film can prompt a tear or two, I think they’ve done something right – even if I am a sentimental and emotional person to begin with). It showcases Scotland’s highlands beautifully and as Merida being an archer too (alongside Katniss Everdeen), maybe we’ll see an interest in Scotland and in archery spiking this year.